I’m best known for recipes the whole family can share, including babies. Even my cocktails are concocted to taste good without alcohol so that kids can share. But there’s one thing I make that’s for grown-ups only: coffee.I wasn’t always a coffee drinker. In fact, I didn’t start drinking the stuff seriously until several years after college, on the first of what became many trips to the magical city of Rome. Coffee is serious business there. Everyone has their favorite spot and mine is Sant’ Eustachio Il Caffe. Maybe it was the excitement of sipping my espresso standing shoulder-to-shoulder with impeccably styled Romans, or perhaps it was just me falling in love with the city—whatever the case, one sip converted me into a coffee drinker. Instantly. I’ve only seen and made frappes with Nescafé instant coffee. In fact, In Greece these are ordered with a quick, “Nes.” The only other info your barista needs is sweet or not (always go sweet). Some supermarkets sell an American version of Nescafe instant coffee, which works fine. Otherwise, you can try your nearest international market—Greek grocery stores will definitely have what you need—or Amazon, where you can pick up “Greek” Nescafé (what you should ideally use). This recipe, which makes 1 serving, calls for you to shake the drink vigorously to create frappe’s hallmark foam head. Alternatively, use a small hand-held milk frother. They work wonders! In a shaker or cup or jar with a tight fitting lid, combine instant coffee, sugar, enough water to come about 1” up the side of your container and a couple of ice cubes. Seal and shake vigorously for at least 30 seconds until very frothy. Alternatively, add coffee, sugar and water to your tall serving glass and use the milk frother until very frothy. 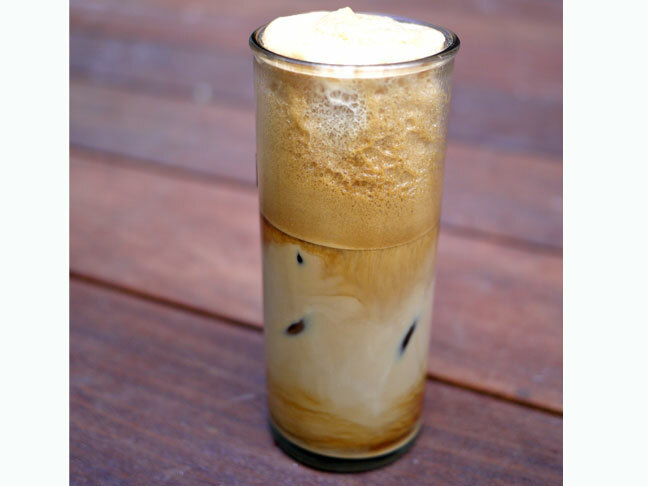 If shaken, pour the frothy coffee, along with the ice cubes, into a tall glass filled about halfway up with more ice. Top with as much milk as you like and finish off with cold water. Otherwise, drop ice into your glass filled with the frothy coffee and top with milk and cold water. Serve with a spoon to mix in any undissolved granules of sugar. In a shaker or cup or jar with a tight fitting lid, combine instant coffee, sugar, enough water to come about 1” up the side of your container and a couple of ice cubes. Seal and shake vigorously for at least 30 seconds until very frothy. Alternatively, add coffee, sugar and water to your tall serving glass and use the milk frother until very frothy. If shaken, pour the frothy coffee, along with the ice cubes, into a tall glass filled about halfway up with more ice. Top with as much milk as you like and finish off with cold water. Otherwise, drop ice into your glass filled with the frothy coffee and top with milk and cold water. Serve with a spoon to mix in any undissolved granules of sugar.